PhD student David Vaughan is working on a project led by Dr Kate Hutson at JCU's Centre for Sustainable Tropical Fisheries and Aquaculture. "Between 30—50% of farmed fish in Southeast Asia, the largest fish producing region in the world, are lost to parasites. Mr Vaughan said scientists knew injured fish visited shrimp 'cleaning stations' to have parasites removed—but the question was whether shrimp then took advantage of the injured fish and fed on their wounds. He said the relationship between cleaner shrimp and their client fish was complicated, with the shrimp known to eat the mucus of the fish and the fish occasionally eating the shrimp. The scientists used high-definition cameras to record the details of the interaction between the species. "We found that shrimp did not aggravate existing injuries or further injure the fish," said Mr Vaughan. He said image analyses showed the cleaner shrimp actually reduced the redness of the injury. "Injuries in fishes are susceptible to invasion by secondary pathogens like viruses and bacteria, and the reduction in redness by shrimp indicates that cleaner shrimp could reduce infections." 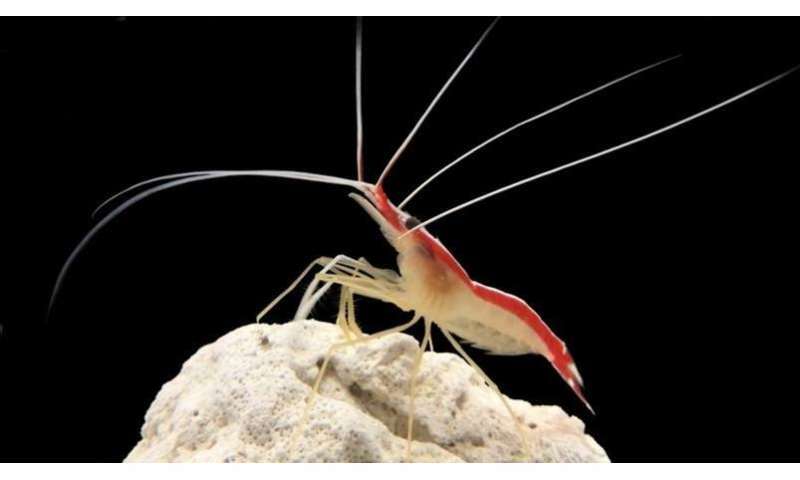 Mr Vaughan said cleaner shrimp are also known to indirectly influence the health of client fishes by reducing stress levels as a function of cleaning—which also increased the ability of the fish to heal.